The ArthurJames/Two and a Half Shovels, Old School/GoldenEight claims of the lower Mugaha Creek valley are 100% owned by Mitch Mortensen. Mr Mortensen has been exploring this region since 2008, staked these claims in 2012 and has been hand testing this area since. The Mugaha Creek Properties are both placer and mineral prospects, located east of the confluence of Mugaha Creek and Williston Lake. Following the research of several reports in this area, and hand testing in 2012 through 2013, it has been decided to propose this mechanical exploration program for 2014. Included with this proposal is the outline for a production program. The purpose of this presentation is to outline a verification process of the previous hand testing with the potential of production (pending investors) within the first year of mechanical testing. The Results of this testing will be sent to a Geologist for the purpose of a prospectus report. 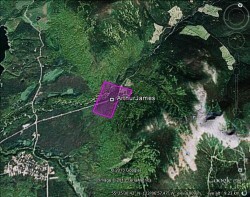 The properties are located 15km north of Mackenzie, British Columbia (BC), Canada. Access to all claims is good with the Forestry road running through the middle of the lower Mugaha Creek claims. The Lower Mugaha Creek property is heavily forested on the north side of the road and dips steeply down to Mugaha Creek. The south side of the road is clear cut and flat in the test pit zone. The Lower Mugaha Creek property consists of 7 MTO placer cells called ArthurJames Claim Tenure#951169 (128.50Hectares), 4 MTO placer cells called OldSchool Tenure#1027578 (73.41 Hectares), 4 MTO Mineral Cells called Two and a Half Shovels Claim Tenure# 1018495 (73.43Hectares) and GoldenEight Tenure#1027580 (73.41Hectares). all claims complete the rights to two zones of potential. The properties are underlain by weakly metamorphosed and complexly deformed rocks of the Upper Proterozoic Misinchinka Group. The Misinchinka Group consists of a thick monotonous sequence of siliciclastic and lesser carbonate rocks of turbidite affinity deposited on the western margin of ancestral North America. Included on the legend "Note: This geochemical interpretation map was produced by blending multiple surveys collected over a period of nearly 30 years, using different sample media (lake and stream sediments) and different laboratory techniques" and report. There is limited historical information for the Mugaha Creek area. However, what information is available has been quite valuable and credible. "During the years 2003 to 2006, extensive geochemical surveys outlined a number of gold-in-soil anomalies southeast of Mugaha Creek in an area of extensive vegetation and overburden cover. One of these anomalies was investigated by hand trenching and outlined a number of narrow, mineralized quartz veins in sheared and faulted slate and siltstone. At least 3 to 5 veins were outlined and could be traced intermittently for about 120 meters along strike and remain open in both directions. Gold values are highly erratic and metallic screening analyses indicate that a significant amount of the values occur as free gold. Mineralized veins are generally sheared and highly fractured and contain sporadic pyrite and base metal sulfides. Eight of 13 trenches cut mineralized quartz veins and values ranged from less that 1 g/t gold over 1.0 meter to a maximum of 139.1 g/t gold over 1.0 meter. Thirteen separate sample intervals contained values of greater than one g/t over one meter. Trench 5 contained a total of 5 separate mineralized veins averaging 1 meter wide over a total width of 15 meters. The characteristics of the Mugaha property mineralization are interpreted to be consistent with the sediment hosted vein gold deposit model. Mineral deposits of this type contain some of the largest concentrations of gold worldwide; e.g. Muruntau, Uzbekistan - 80 million oz; Sukhoy Log, Russia – 20 million oz. ; Bendigo-Ballarat district, Australia – 20 million oz; Macraes Flat, Otago Schist Belt, New Zealand – 5.2 million oz. At the Mugaha property only one of approximately 25 gold-in-soil anomalies within an area measuring 5 km by 3 km has been partially explored by trenching. There is therefore excellent potential for the discovery of similar gold mineralization. The technical content of this news release has been reviewed and approved by James M. Dawson, P. Eng who is a qualified person as defined by National Instrument 43-101"
Please note, Oldschool claim is attached to ArthurJames but doesn't show on the google earth picture. The mineral claims and placer claims are stacked over the same area.